Frei Otto was born in Siegmar, Germany, on May 31, 1925, and grew up in Berlin. “Frei” in German means “free”; his mother thought of the name after attending a lecture on freedom. Otto’s father and grandfather were both sculptors, and as a young student, he worked as an apprentice in stonemasonry during school holidays. For a hobby he flew and designed glider planes — this activity piqued his interest in how thin membranes stretched over light frames could respond to aerodynamic and structural forces. When he had his university-entrance diploma in 1943, Otto signed up at once to study architecture, but he was not allowed to. Instead, he was drafted into the labor force. In September 1943, Otto was called for military service and he trained as a pilot. The pilot training was stopped at the end of 1944 and Otto became a foot soldier. In April 1945, he was captured near Nürnberg and became a prisoner of war. He stayed for two years in a prisoner of war camp near Chartres in France. There he worked as a camp architect; and he learned to build many types of structures with as little material as possible. After the war, in 1948, Frei Otto returned to study architecture at the Technical University of Berlin. His architecture would always be a reaction to the heavy, columned buildings constructed for a supposed eternity under the Third Reich in Germany. Otto’s work, in contrast, was lightweight, open to nature, democratic, low-cost, and sometimes even temporary. In 1950, with scholarship funds, he embarked on a study trip through the United States, where he visited the work of Frank Lloyd Wright, Erich Mendelsohn, Eero Saarinen, Ludwig Mies van der Rohe, Richard Neutra, Charles and Ray Eames, among others. During this time he also studied sociology and urban development at the University of Virginia. In 1952, Frei Otto became a freelance architect and founded his own architectural office in Berlin. He earned a doctorate of civil engineering at the Technical University of Berlin in 1954. His dissertation Das Hangende Dach, Gestalt und Struktur (“The Suspended Roof, Form and Structure”) was published in German, Polish, Spanish and Russian. Also in 1954 he began work with “the tentmaker” Peter Stromeyer at L. Stromeyer & Co. In 1955, he designed and built (with Peter Stromeyer) three lightweight minimal temporary structures made of cotton fabric for the Bundesgartenschau (Federal Garden Exhibition) in Kassel, Germany. These were his first works to gain national recognition, in part for how they harmonized with nature. Frei Otto pioneered the use of modern, lightweight, tent-like structures for many uses. He was attracted to them partly for their economical and ecological values. As early as the 1950s, he built complex models to test and perfect tensile shapes. Throughout his career, Otto always built physical models to determine the optimum shape of a form and to test its behavior. Engineers in his studio were early adopters of computers for structural analysis of Frei Otto’s projects, but the basic input data for these calculations came from the physical form-finding models. In 1958, Otto founded the first of several institutions he would establish that were dedicated to lightweight structures — the Institute for Development of Lightweight Construction, a small private institute — and opened a new studio in the Zehlendorf district of Berlin. Over the next five years he taught periodically in the United States, taking on visiting professorships at Washington University, St. Louis; Yale University; University of California at Berkeley; the Massachusetts Institute of Technology; and Harvard University. The establishment of the Biology and Building research group at the Technical University of Berlin in 1961 marked the beginning of his cooperative work between architects, engineers, and biologists. They applied their knowledge of tents, grid shells, and other lightweight structures to better understand the designs of biological structures and forms. In 1962, Otto published the first volume of his major opus Tensile Structures: Design, Structure and Calculation of Buildings of Cables, Nets and Membranes (the second volume was published in 1966). In 1964, he became director of the newly founded Institute for Lightweight Structures (Institut für Leichte Flächentragwerke or IL) at the University of Stuttgart. IL was commissioned by the German government to conduct research in connection with the planning of the German pavilion for the 1967 International and Universal Exposition in Montreal, Canada, better known as Expo 67. The leaders of Germany chose Otto’s architecture to demonstrate the nation’s post-World War II industrial and engineering expertise and innovative technologies. The resulting German pavilion at Expo 67, created in collaboration with Rolf Gutbrod and Fritz Leonhardt, gave Frei Otto his international breakthrough as an architect and a design engineer. It's an early example of a large scale, passive solar building. The following year, in 1968, Otto was named an Honorary Fellow of the American Institute of Architects, and IL was commissioned by Olympia Baugesellschaft in Munich to develop construction measurement models for the projected roof of the main sports stadium in the Munich Olympic Park. The project, realized in May 1972, by Günter Behnisch, Frei Otto, and Fritz Leonhardt, for that year’s Olympics, comprised a large membrane to cover the stands of the Olympic stadium, a tensile structure arena, a fabric roof over the Olympic swimming pool, and hyperbolic membrane canopies to connect the buildings and protect visitors from rain and sun. In 1969, Otto established the Atelier (Frei Otto) Warmbronn architectural studio near Stuttgart. There Otto and his teams researched construction methods that could be highly effective with very little material. It happened that the forms of Otto’s buildings often found similar solutions to those in nature and thus resembled natural forms such as bird skulls and spider webs. Otto wrote extensively throughout his career. His book Biology and Building was published in 1972 with a second volume the next year. Later research led Otto to write about the structural and building properties of bamboo, crustaceans, and soap bubbles. In 1994, he published Ancient Architects on structural inventions from the earliest days of building. From 1964 to 1991, Otto was a full professor at the University of Stuttgart, and in 1991, he was named emeritus professor. Over the years, Otto’s research teams would include philosophers, historians, naturalists and environmentalists. He is a world-renowned innovator in architecture and engineering who pioneered modern fabric roofs over tensile structures and also worked with other materials and building systems such as grid shells, bamboo, and wooden lattices. He made important advances in the use of air as a structural material and to pneumatic theory, and the development of convertible roofs. Otto made the results of the research available to other architects. He always favored collaboration in architecture. To cite just two examples: from 1975 to 1980 Otto worked with Rolf Gutbrod and Ted Happold to build a tent-like gymnasium for the King Abdulaziz University in Jeddah, Saudi Arabia, and Otto co-designed the Japanese pavilion at the 2000 Hannover Expo with architect Shigeru Ban (who received the Pritzker Architecture Prize in 2014). Frei Otto was recognized with his first major monographic exhibition in 1971 at the Museum of Modern Art (MoMA) in New York. (A redesign of the exhibition later traveled in 1975 and 1977 to venues in North America, Europe, Asia, and Australia). The exhibition “Natural Constructions,” which featured his work, was organized by the Institute for International Relations in Stuttgart in 1982 and shown in Goethe Institutes in approximately 80 countries. In 1984, he became a founding member of the Special Research Project 230 “Natural constructions — lightweight construction in architecture and nature” of the German Research Foundation, which included the participation of four major universities in Germany. As the largest interdisciplinary German research project, it involved architects, engineers, biologists, behavioral scientists, paleontologists, morphologists, physicists, chaos theorists, physicians, historians, and philosophers. This project was completed in 1995. 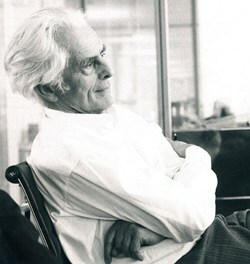 Among numerous accolades, Frei Otto was awarded the Thomas Jefferson Prize and Medal in Architecture by the University of Virginia in 1974; the Medaille de la recherché et de la technique by the Academie d’Architecture, Paris, in 1982; the Grand Prize and gold medal by the Association of German Architects, also in 1982. He received the 1980 Aga Khan Award for Architecture (together with Rolf Gutbrod) for the conference centre in Mecca, Saudi Arabia, and the 1998 Aga Khan Award for Architecture (together with Omrania and Happold) for the Diplomatic Club in Riyadh, Saudi Arabia. He was named Honorary Fellow of the Royal Institute of British Architects, London, in 1982 and Honorary Fellow of the Institution of Structural Engineers, London, in 1986. In 1996, he received the Grand Prize of the German Association of Architects and Engineers, Berlin. In 2005, he was awarded the Royal Gold Medal of the Royal Institute of British Architects (RIBA). In 2006, the Japan Art Association awarded him the Praemium Imperiale in Architecture.